Are you fed up fumbling with the small buttons of your bedside alarm clock to set up the wake-up time properly, in particular when it is very late and you are tired? Do you have low vision and have difficulty seeing the small buttons? Or in the extreme case, are you blind, and can not even see the buttons and the settings on the clock? If the answer to any of these questions is a big "YES! ", there is nowadays a solution for you: the Voice Activated Clock. Voice Activated Clocks recognize spoken words and accept commands to execute certain tasks like setting the wake up time without having to touch any part of the clock! You can find nowadays a number of companies that make various types of voice activated clocks that offer a range of features that vary from one brand to another. In this article, we will present and compare the voice activated clocks most popular among Amazon customers: the Moshi and the ivee Flex. Moshi is quite a unique product! It is the first interactive speech recognition alarm clock, and it has the best voice recognition technology available nowdays. You basically initiate a simple "conversation" with it by saying "Hello Moshi". The unit responds by saying "Command Please". Then, you can respond by any of the 12 spoken commands that the unit recognizes. 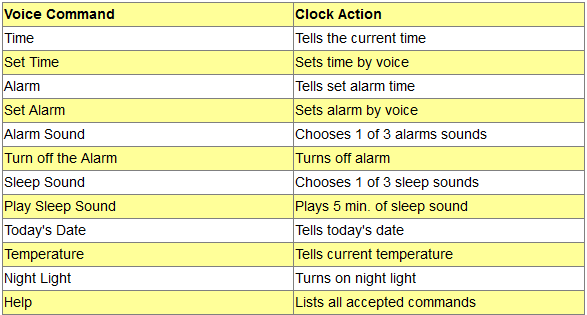 Using these commands you can get the unit to set your alarm without even leaving your bed, find out what the current temperature is, and even check the time while you are in a different room. Moshi is of course also ideal for people with low vision or no vision. As such, Moshi is recognized by the World Blind Union and received a major award at the 2009 Consumer Electronics Show. It features 3 distinct alarm sounds, 3 distinct sleep sounds, and it measures 7 1/2 by 3 1/4 by 4 1/2 inches. It requires three AAA batteries ( not included). Note that Moshi also makes the slightly larger Moshi Elite voice activated desk clock that has all the features of the basic Moshi and an additional feature of 5-minute sleep sound track featuring sounds of water, waterfall or birds. ivee Flex (Ivee Digit) is a digital alarm clock with a 5" LED display and works in a similar way to the Moshi clock. You initiate a conversation by saying "Hello ivee". You can say, for example, "Set Alarm 2". The unit can understand over 30 spoken commands and can provide users information verbally. You can also ask the date, the time and the temperature, and it will respond verbally, promptly and accurately. The voice recognition works quite well and filters ambient noise like outdoor traffic. The voice recognition capability of ivee Flex was recognized by the World Blind Union. It measures 4.72 by 9.65 by 4.92 inches and uses either 3 AAA batteries (not included) or an AC adapter (included). ​So which voice activated clock to buy? ​The two voice activated clocks considered here are quite similar in functionality, appearance and price. At the time this article was written, they had also received a comparable average rating of 3.5 stars from Amazon customers. There is a good chance that you would be quite happy with either of these two products. Note however that ivee Flex can understand and respond to more commands than Moshi can, and that it costs slightly more than the Moshi.